Mission Santa Barbara was the twelfth mission built in California, founded December 4, 1786, by Father Fermin Lasuen. 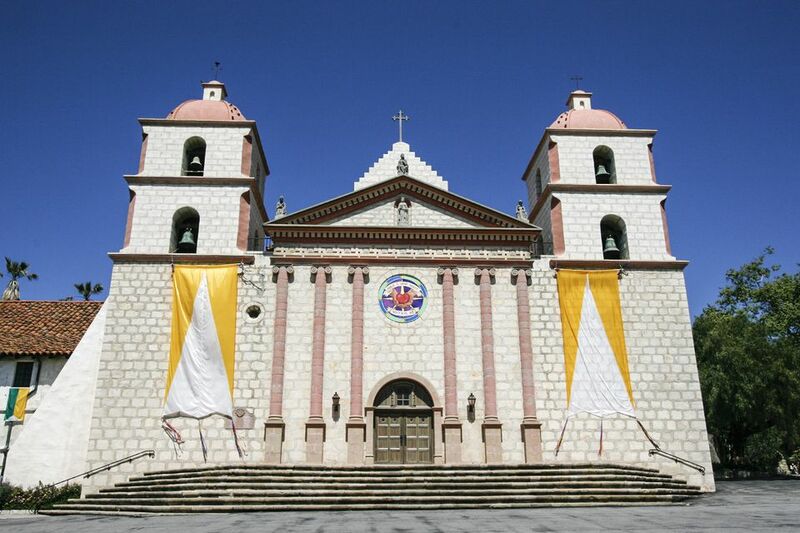 The name Mission Santa Barbara means is in honor of a fourth-century martyr, because it was founded on her feast day. 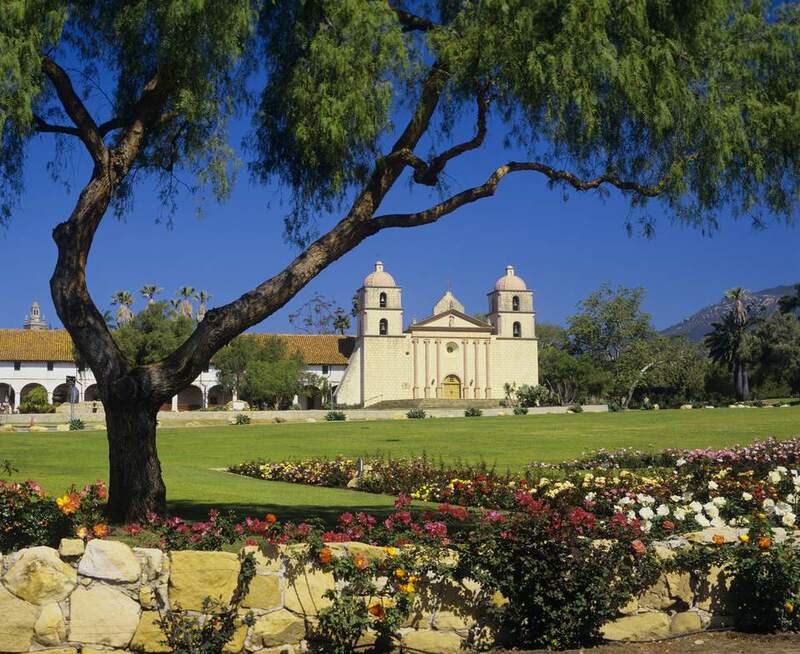 Where Is Mission Santa Barbara Located? Mission Santa Barbara is located at 2201 Laguna St in Santa Barbara, California, northeast of downtown. Exit US Hwy 101 on Mission Street, turn left and follow the street until it ends at Laguna St. in about a mile. Turn left on Laguna and go 2 blocks straight ahead. The place that became Santa Barbara mission was shown on Spanish maps long before the beginning of the missionary era. The spot was named by Vizcaino about forty years after Spanish explorer Juan Cabrillo first discovered it in 1542. The Catholic fathers were in California for 13 years before they founded Santa Barbara Mission, and they had a very difficult time in the beginning. Governor Felipe de Neve openly preferred colonists to Native American neophytes. However, at a meeting in San Gabriel, de Neve agreed to let the fathers start the Santa Barbara Mission. In 1782, a party set out from San Gabriel to found two new sites. The town was founded without de Neve and the fathers moved on to Santa Barbara Mission, where de Neve joined them. The military presidio was established and Father Serra helped prepare the military chapel. However, when Father Serra wanted to start work, de Neve refused. It would be four years before Santa Barbara Mission was finally founded. In the meanwhile, Father Serra returned to Carmel, where he sickened and died in 1784. De Neve was replaced by former governor Pedro Fages. Fages was not friendly to the missionaries either, but finally, he gave permission to start. Father Fermin Lasuen presided over the founding on December 4, 1786, the day of the feast of Saint Barbara. Lasuen left Father Antonio Paterna in charge, and he supervised early construction. Santa Barbara mission had good luck from its beginning. The first permanent church was completed in 1789. Within five years, it became too small for the growing population and it was replaced. The native people liked the fathers and soon there were more than 1700 neophytes living in 250 adobe houses. A large stone reservoir they built is still part of the city's water system. In 1812, an earthquake destroyed the church and construction of the current church began shortly afterward. Father Antonio Ripoll supervised construction. Built of stone, it was begun in 1815 and finished in 1820. In 1818, the French pirate Bouchard approached the coast and threatened the nearby town. The Fathers armed and drilled 150 of their neophytes to prepare for the attack. With their help, the Presidio soldiers faced Bouchard, and he sailed out of the harbor without attacking. The Mexican Revolution occurred in 1822, and the Fathers started to have more and more trouble with the soldiers at the Presidio. Long-standing resentment between the Spanish-born and those born in the Americas was fueled by the Spanish king's preferential treatment for the Spanish-born. Shortly after the revolution, all Spaniards under the age of 60 were ordered to leave California, but the order was never enforced. The soldiers began to take over the task of policing the natives, and trouble between the soldiers and the natives began. In 1824, there was an Indian uprising against the soldiers at three places including Santa Barbara Mission. The Indians broke into an armory and overcame the guard. Two soldiers were wounded. The soldiers punished the Indians so severely that all of them who were not caught immediately fled the area. It took the Father Presidente more than six months to secure a pardon for the Indians, and a few then returned. In 1833, governor Jose Figueroa put American-born Franciscans in charge of all missions north of San Antonio. In 1834, Mexico decided to end the missionary system and sell the land. Father Presidente Narciso Duran moved his headquarters here, and in 1842 he was joined by Francisco Garcia Diego, first bishop of the Californias. Their presence saved Santa Barbara Mission from being appropriated until 1846 when they both died. Pio Pico immediately tried to sell Santa Barbara Mission, but it was saved when the United States took over California before the new buyer could occupy their property. The buildings were used for a school and seminary in the late 1800s. In 1896, a seminary was opened, and a Franciscan School of Theology was located there until 1968. It is now used by the local Parish. The first mission buildings were made of logs with thatched roofs. Later construction was adobe. There were four churches built at Santa Barbara, counting the original temporary chapel, before the current building was built and completed in 1820. Today's church is 161 feet long, 42 feet high and 27 feet wide and its walls are six feet thick. The original church had only one tower, but a second was added in 1833. These matching twin towers are 87 feet tall. The sandstone facade of the church was designed after an ancient Latin temple in pre-Christian Rome. Father Antonio Ripoll copied the design from a Roman architecture book brought by the Franciscans. The sandstone came from the Santa Barbara area. Building started in 1815 and finished in 1820. Because of its continuous occupation by the Franciscans, the mission today remains much as it was when it was built. However, the mission building suffered a lot of damage in an earthquake in 1925. It took two years and $400,000 to restore it. Later, a chemical reaction in the restoration materials weakened the structure, and the front of the church had to be rebuilt in 1950. You don't normally see models of Mission Santa Barbara that show this layout. It takes a lot of research to realize that the mission had not just one but two quadrangles at its peak. The Mission Santa Barbara picture above shows its cattle brand. It was drawn from samples on display at Mission San Francisco Solano and Mission San Antonio.